This is an original item created by MONOCIRCUS. 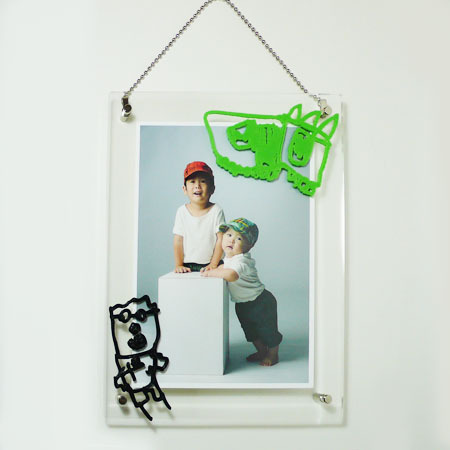 Send us a drawing done by your child, and we will create a photo frame that is customized just for your family! With the advancement of digital photographic technology, we are able to take and record tons of photographs and videos with just a snap but somehow it is often hard to safekeep the spontaneous sketch or paper craft works done by our children. Taking a closer look at the spontaneous doodles by children, we more often than not discover the way they view and think about the world they see, and uncover their characteristic as an individual. We see it as ART. We hope to make it possible for you to keep a proper physical record of that inspirational moment, decorate your home with it and show and brag to everyone who comes by! 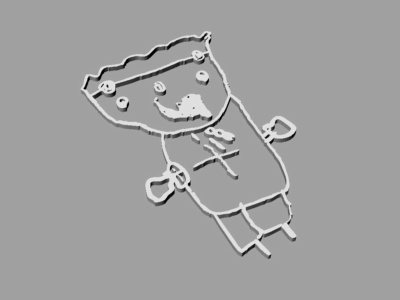 Step 2: With the drawing we receive, a 3D model will be prepared based on the drawing as shown here. The thickness of the linework, the pressure of the pencil marks, or the textured result of crayons will be adjusted over here to enable the best result. Step 3: This picture shows the actual outcome of a 3D printer. In this example, we have used brown colored plastic. Quite a bit of adjustments to the printer is required before a good final outcome is possible but with a drawing of this size, it takes about 2 hours to be 3D printed. After printing, the outcome is cleaned up, laid out and then finally adhered to the acrylic sheet of the photo frame.